The family. Not something the contemporary left is terribly good at talking about, the family. Mere mention of the word can bring about fits of blushes in the more timid whilst raising the hackles of an energetic few just waiting to pounce on anything that smacks of judgement or prejudice. When, in the occasional burst of courage, the left does advance and broach the subject of the family, the words that come out of its mouth are often so vague and platitudinous as to verge on the meaningless. They do not say anything in particular, because they think not saying anything in particular is the safest thing to say. Or, worse, they believe that not saying anything in particular is the right thing to say. The reasons for this are myriad, though one main problem is that there are so many people one can potentially upset, or at least presume to upset (which is not quite the same thing). So many identities and ideologies, so many lifestyles and life choices, all of which must be respected if we are to fulfil what has become the ultimate and overriding goal of the contemporary left: to be inclusive. The logic of this is circular, as we shall see, but for now suffice it to say that talk of the family can appear such a toxic issue because, save for the release of saccharine niceties laden with innumerable caveats so as to avoid all possible offence, it is just so hard to get right. Politicians, terrified of appearing moralistic before an electorate who know all too well the shortcomings of the political classes, instead choose silence for fear their appeal to accounts of the good might instead appear as diatribe delivered from upon high to those living on the truly sharp edge of such realities. For those who disregard the taboos, who earnestly appeal to the values of the Labour Party they grew up with, the values of their parents and grandparents before them, who speak honestly and unambiguously about the family, its importance to society, its breakdown, the role of the state in its breakdown, and the consequences of that breakdown – for those courageous souls the political collateral is significant. If their ideas are tolerated then their presence within positions of prominence with which to enact their delusions and/or prejudices most certainly is not. Such speakers are banished to the fringes, since in daring to say something particular they also sound exclusionary, thereby abandoning (their opponents would claim) those vulnerable people whom the aim of Labour it is to champion. Yet it must be recognised that the left have not always placed themselves in this position. There was a time when talked openly and freely on the subject of the family, primarily because it talked openly and freely about moral imperatives and the common good without the constraints of relativism and reticence that so besets the contemporary left. Which leads us to the single biggest reason why the contemporary left does not and often cannot talk effectively about the family: it has embraced a creed that limits its ability to do so. Politics has become a shadow play. In reality, economic and cultural liberalism go together and increase together. The left has won the cultural war, and the right has won the economic war. But of course, they are really both on the same side. As such, the contemporary left has wandered down a logical and political blind-alley. Cognisant of ways in which liberalism in the economic markets has ravaged communities, it refuses to countenance ways in which liberalism in the social markets has produced the same. Able to give coherent accounts of how economic capital, or the lack of it, can corrode the roots of family life, it nonetheless stumbles and stutters when confronted with how social capital, or the lack of it, has proven every bit as insidious. The contemporary left will acknowledge that the family was the traditional bulwark against the acute poverty suffered by our forebears, though refuse to countenance ways in which the ‘progress’ championed by Labour Mum, to use Maurice Glasman’s terms, has often come through jettisoning precisely those protective customs and conventions once upheld by (now-cowed) Labour Dad. In what follows I shall try to give an account of how these ideas inhibit the left’s ability to talk meaningfully about the family, a dereliction that has harmed its core constituency more than any other. The evidential argument is not one that I seek to offer. The evidence pertaining to the broad superiority of the stable family for producing positive life outcomes for children is so overwhelming that it seems tedious to reproduce it here. Besides, such an argument is unlikely to convince those that have set their face against it, precisely because they have set their face against it primarily on non-evidential terms. The questions I shall attempt to address, then, are these: how has this situation come pass? What form has it taken? And what can Blue Labour offer in response? To tell the tale of the revolutionary New Left is actually to tell the tale of the gradual triumph of radically right-wing accounts of the social sphere. Or, perhaps more accurately, it is to document the gradual triumph of a fundamentally asocial ideology able to manifest itself in the language and thought of both wings of the political spectrum. It is for this reason that the saga is not restricted to the political left, even whilst we can readily admit that the political left is where the culture and thought of which we speak originally found its most obliging host. Rather, documented here is the broad advance of an idea, a habit of thought, which gradually commanded loyalty across the political spectrum. The left’s role as recounted here, therefore, was as much through contribution to the evolution of this doctrine as through the pursuit of particular legislation, be it their own or that of others. The key word that frames the entire movement here described is ‘liberty’, the cherished goal that runs through the very DNA of the New Left. However, the liberty of the revolution was not, to phrase it in Blue Labour terms, constructed within relational frameworks drawing upon notions of virtue to define civic and social freedoms, but was instead portrayed as the autonomous individual empowered to freely contract relationships of consensual exchange. Liberty so defined was predicated upon a rejection of the social: the founding principle was that agents should have freedom to enter the social marketplace as autonomous actors, liberated of unwarrantable restraints spread horizontally throughout the community and/or imposed vertically through the levers of the state. Thus, the organic interweaving of civitas and societas that traditionally constructed the ‘social conscience’ within which the individual operated as one interconnecting link in a living social chain, was gradually decried as imposing upon the individual illegitimate restrictions to the reasonable pursuit of self-interest. Norman Dennis, speaking from within the tradition of English ethical socialism, commented on the similarities between free-market thinking and the post-1960s social and sexual revolution championed primarily by a middle-class intelligentsia. For him, the common feature was the primacy of self-interest over ‘the irrational restrictions of socially inculcated ‘conscience’ and rules of conduct regarded as being absolutely binding regardless of the wishes or welfare of the particular individual’. In other words, potentially restrictive claims of family, custom, community or tradition were out, and the pursuit of self-interest was in. In this sense, the social revolutionaries really were constitutionally anti-social, the ASBO generation of their time. They elevated ‘I’ over ‘us’, promoted the pursuit of individual goals over claims of communal interest, and used the reasoning they would later claim to eschew in order to achieve it. Laissez-faire liberalism was embraced in the personal sphere even whilst denounced, for a time at least, in the economic. Or, put more glibly, what the New Left claimed to reject in the boardroom they demanded in the bedroom. The problem was, as Phillip Blond has argued, this deified not choice but rather the act of choosing, such that the left’s accounts of autonomy no longer consisted in a particular vision of the good life, based upon distinctions between good and bad choices, but instead on an illusory ‘neutrality’ that offered only the guarantee of the freedom to choose. The refusal to distinguish between successful and unsuccessful attempts at the art of living well left politicians using libertarian means to pursue libertine ends, such that fashionable political mantras focussed exclusively on the noble ideal of giving people more power, without ever indulging discussion on what people ought properly to do with it. The role of the state was not to cajole citizens into making the kind of life choices that the chief custodians of relational politics, tradition and community, had long decreed were best for both individual and society, but rather to remove potential impediments to self-fulfilment and secure the capacity of the individual to act as an autonomous agent within the social marketplace. Here, then, the source of disdain against those heresies to the progressive creed, social and moral conservatism, that articulated fixed ideas on behavioural standards in satisfaction of the obligations one owes principally toward not oneself, but others. As such, the advance of the New Left established the near wholesale acceptance within the Labour Party, and more recently within the Tory Party too, of the language and logic of absolutised individual sovereignty: the belief that society, custom, convention, ritual, duty, responsibility, taboo and tradition held no legitimate transcending claim over individual action – that these were arbitrary, unreasonable and illegitimate, remnants of a romanticism that the new rationalism does not permit. Individuals were competitors in the social markets, and so long as interactions were conducted upon lines of mutual consent then good government consisted in guaranteeing the freedom necessary for that exchange. Whilst this constituted a departure from certain classical liberal thinkers, who upheld the importance of social restraints even if they could not adequately explain why, the triumph of coldly contractual accounts of the social revealed the Rousseauian ancestry from which it derived, such that the idea that commitments should pertain beyond the collapse of mutual consent was anathema. Liberal economic dogma was producing an army of free-marketeers on the political right who maintained that two independent agents should be allowed to enter freely into contracts of exchange without external interference; preceding it was an army of free-marketeers on the left using much the same arguments to break open the social markets. Accordingly, the left became stultified by an attempt at neutrality that neutered its ability to articulate the moral instincts of the many, choosing instead to level down all life choices as equally valid and tarring those who challenged such accounts of freedom as moralistic, judgmental or prejudiced. In so doing, the left ceased to communicate what its tradition instinctively knew: that true and authentic freedom comes not through liberation of choice, but through the act of choosing wisely. Thus welfare became the vehicle that reflected and advanced the newly reconfigured social arena: if a key Blue Labour principle is ‘no responsibility without power’, then this comes a rejection of the statist liberalism that had guaranteed power and eschewed responsibility. The theoretical universalisms which informed accounts of individual freedom thus nudged welfare provision toward assessment of need, freed of important contextual detail. The inherent relativism in the ‘freedom’ of the New Left produced a morally-neutral welfare system offering assistance regardless of personal behaviour. On such terms the state alleviated only material deprivation, a morally-neutral scale that did not impinge upon the free agency of the individual. The result was a system that increasingly bore the cost of family breakdown rather than challenging it. Mitigation soon resembled facilitation. Welfare, then, corroded those behavioural norms and expectations that historically constituted the social conscience. Welfare was rendered a ‘right’ distinct from any authentic notion of reciprocity, precisely because the commonly held moral framework within which reciprocity might have held meaning was denied by the relativism inherent to the system. As such, welfare became disconnected from the lived realities of its recipients, no longer reflecting situated concepts of fairness or justice. Detached, distant, bureaucratic, unreflective of the moral framework within which most people still operated, at times even agitating against it: little wonder that public faith in the system corroded. Old networks underpinning community and place, family and friendships, had fallen prey to the flourishing doctrine of social isolationism among our newly nihilistic elites. Putting right this wrong, through the resurrection of a reciprocal, contributory approach toward welfare, has become a touchstone issue for Blue Labour, an instinct that has received broad support across the political spectrum. The cumulative effect of these changes was a challenge to the primacy of the family as the fundamental social (and socialising) institution, the unit that had proved the most effective safety net and ladder for the most vulnerable. In making neediness the criterion for state help, so neediness itself was incentivised, implicitly encouraging the abandonment of those relational bonds that could now actually render one less eligible for state assistance. The state had, in effect, bypassed lateral relations and set up a panopticonic relationship between the individual agent and the central authority – what John Milbank has termed the ‘simple space’. The condition-free support of the state provided an easy alternative that undermined family authority and its capacity to influence behaviour. Obligations proper to kith and kin, and the power of kith and kin to insist on them, had been negated in the name of freedom. Far from being an unforeseen consequence, such a development was the logical outcome of the marketization of personal and social relationships, since if the state was obliged to preserve freedom of contract then it also had to accept the freedom of individuals to break contract. In the family realm, this meant two individuals could legitimately separate simply because they no longer wished to be together, regardless of third party commitments. Obligations beyond the pursuit of individual happiness, such as the presence of children in the family home, no longer had the moral gravity to trump the pursuit of self- interest of those adults that had entered into the original agreement. Divorce law began to reflect this change. Research bodies and charitable organisations, pockets full with government funding, celebrated new diverse family forms that began to take shape and disparaged the notion that the old model was best. The state funded more and more schemes to advise, support and help pay for divorce and separation, through legal aid, whilst remaining strictly indifferent to whether divorce or separation was the desirable outcome. The idea that policy might be developed to actively build resilience and stability within the family, as recently outlined recently by Jon Cruddas, was largely anathema. Yet again, mitigation began to look like facilitation. The extended family unit, appealed to as the saving grace by those seeking to stress the outmoded character of the nuclear model around which extended ties spread, became harder to establish since the strong and closely-knit extended family grew around the stability of the founding unit, that being the mutual creation shared by mother and father of the child. The blood and guts realities of such freedoms, the significant statistical deterioration of potential life outcomes for children growing up in such circumstances, or the significant increase in the likelihood of child abuse in non-traditional family structures, was brushed aside through a mixture of what Norman Dennis has neatly referred to as Social Micawberism and the habit of treating genuinely heartbreaking exceptions to the rules as the normative policy by which to proceed. Swathes of evidence mapping the significant statistical deterioration of life chances for those experiencing family breakdown, data illustrating the disastrous effects on the poorest communities, even the impassioned testimonies of those living on the sharp edge of such realities, was routinely rebuffed with manufactured ambiguities and smear: this was really just a right-wing attack on single-mothers, or the outrageous imposition of the right-wing bigotry of a previous age, or the chauvinistic right-wing assumption that women need men in child-rearing. That the consequences most acutely affected the poorest allowed the professional left to convince themselves, in a neat non-sequitur, that the sole enemy was poverty, even whilst its own tradition held that impoverishment could be caused by and expressed through more than just the material. As such, the wider cultural erosion of the family hastened the triumph of the free marketeers, who asserted the natural right to independent action, an account of liberty more structured toward removing restraints on the powerful than enhancing the life chances of the vulnerable. The result, more often than not, was the same: the poorest, without the resources to absorb the consequences of this latest revolution, more reliant than their empowered comrades on those institutions and safety nets that the new philosophy corroded, became most entrapped by the pernicious consequences of it. The most vulnerable became more enchained by circumstance, all in the name of making them free. Indeed, so complete was the triumph that Labour even pursued the dissolution of those charitable institutions that maintained the primacy of the traditional family unit as the framework within which to provide loving and stable family homes for vulnerable children. The traditional family unit was no longer a protected model, and had to be opened up to free-market competition. Any political move to suggest otherwise was fiercely rejected. Those who refused the move, who elevated one model over another, who practiced market protectionism, soon found themselves on the wrong side of the law. Not because of any sense that harm might come to children helped by such agencies, but rather because the refusal to embrace neutralism collided with the dogmas of the new open-market morality. The language within which such action proceeded perhaps provides the best view of the phenomenon I am attempting to describe; Catholic adoption agencies were closed down, even whilst the pool of adoptive parents was (and has continued) in an alarming downward spiral, since it was deemed they contravened equality laws constructed to prevent discrimination in the provision of ‘goods and services.’ Whilst Catholic adoption agencies spoke of vulnerable orphans needing the love of mothers and fathers, Labour was theorising equality through access to markets, to ‘goods and services’. Whilst the social revolution of the 1960s can be linked to the economic revolution of the 1980s in many ways, one key theme around which both came to coalesce was the notion that financial independence, viewed in isolationist terms, was the guarantor of individual sovereignty. Not genuine independence, with individuals owning the means or fruits of their production, but relational independence, visualised as freedom from monetary reliance upon others within the immediate circle of relationships. To be free, the individual had to be able to be alone. As such, fathers were increasingly redundant. Young men were made the beneficiaries of a philosophy that claimed to liberate females, dissolving as it did traditional accounts of obligation and duty, eradicating those civilising and socialising responsibilities traditionally bestowed by social rites of passage, chief among them being fatherhood. Whilst the financial implications of fatherhood could be met by the state, the idea gained momentum that children suffered no developmental or emotional impairment from the lack of a father-figure within the family home. Thus mothers were convinced they need not rely upon men, whereupon more and more young males became the kind of men that women really could not rely upon. Whilst the state could offer autonomy through welfare provision, for most financial sovereignty came through labouring for a wage. Or, put another way, by the new rules of the game people were most free when they worked, which for the vast majority meant when they worked for someone else. Such logic was untouched by older insights on the spiritual value of work, insights that informed a once widespread critique of capitalism, but focused instead on the capacity to labour for a wage in order to prevent dependence on others. Thus, in a neat irony, subjugation to capitalist interest was all of a sudden a legitimate means of securing autonomy, rather than the chief impediment against it. This distinctly anti-social autonomy was still, for the majority, framed in terms of reliance, only now reliance was spread outside of the immediate relationship circle and toward distant agencies, thus freeing the individual from dependence upon those within their vicinity. This narrative proved most radical for women, traditionally financially dependent on their spouse, and was instructive of the creeds of a particular, privileged middle-class movement trading on the theories of a nineteenth-century factory owner that the domestic was the most intimate site of the exploitative capitalistic economy. All of a sudden, relying on the income of a spouse was an affront to authentic autonomy rather than a possible, if not only, enabler of it. Thus the progressive march set about removing all obstacles to entry into the workplace: the irony did not register that in so single-minded a pursuit one saw eliminated all those competing loyalties and commitments that might traditionally have preserved the freedom of women not to be co-opted into a lifetime on the factory floor. With competing ties dissolved, accordingly the left began to treat mothers as absentees from the marketplace, a truancy that dovetailed with a coldly bureaucratic vision of mothers as independent economic units, not yet fulfilling their potential, to be re-entered into the markets as soon as the opportunity presented itself. Here, the value and importance of domestic work was downplayed, precisely because it did not conform to either market liberalism and GDP generation, or a new and highly particular form of feminism unwilling to value the significance of work done in the home. The positive freedom to choose stay-at-home parenting received limited support, an unproductive lifestyle choice, less desirable than re-entry into the GDP generating workplace. Government assistance here also combined with market forces to exert pressure on women to become GDP generators once more, abrogating to the state responsibilities once undertaken within the family home, intertwining nudge welfare designed to bring new mothers back into the workplace. The outcome was a left-wing politics that thought it best represented mothers by removing all obstacles, biological and familial, to their re-entry into the workplace. In reality, an already empowered group were raising to the status of universal progress that which best coalesced around their own interests, desires and priorities. The equality narrative took on a distinctly middle-class air, such that progress focussed on the relative lack of females in the boardrooms of top companies and corporations and rarely addressed the changing economic landscape that, over the decades, had made stay-at-home motherhood, or indeed fatherhood, a privilege exclusive to the wealthy classes. Clearly discernible was the latent prejudice which deemed domesticity unable to secure either empowerment or autonomy, so that those seeking independence must either forsake one or juggle both. The instinct stemmed from the liberal re-envisioning of relationships: ‘family is often, after all, an impediment to freedom and autonomy, a constraining realm of obligation and duty.’ In the guise of freedom to work, Labour increasingly demanded that all did so: they fought the good fight for parents to have freedom from the family, but expended far less effort in guaranteeing the freedom to stay with the family. And rarely did the welfare claims of children feature in this negotiation of individual freedoms. This same restraint toward the associative ties of the family was also evident in education policy. After all, if parents were to be coaxed back to work, then schools needed to pick up the slack. Schools thus took on more and more responsibility for child welfare, and on much broader criteria than the traditional responsibility for development of the intellect. Once deemed to exist in order to assist parents in the education of their children, for our political classes schools took on the role of parenting our children, too. Policy had long marched toward wrap-around child care, which both underpinned the freedom of parents to work whilst keeping the markets serviced with reliable labour. This reached a peak under Michael Gove, whose inability to draw the line between family and state became a defining characteristic of his liberal interventionism, speaking regularly of a vision in which schools were childcare units, complete with longer days, shorter holidays, summer camps and sleepovers. Such a blurring of the lines were advanced amidst pious cries of ensuring children ‘get a good start,’ or for helping families ‘juggle family life and work commitments’. In the clash between the market, the family and individual empowerment, our political classes decided we best help the family by paying for parents to spend less time with it. This presumption of fracture is clearly visible in what has become the cause celebré of education reformers: social mobility. Whilst academic attainment is almost universally desired by parents, the cold utilitarianism that has long underpinned the reformers’ approach betrays an implicit distaste – educational achievement for the poorest is too often about ensuring poorer children are different from their parents. With the absence of any account of the value of rootedness and place, social mobility became little more than the ability to move away from those we know and love, a phenomenon that affected the regions more acutely since moving away was often the non-negotiable price for pursuing such accounts of success. Thus, family and background was a potential drag, something to be left behind or at the very least overcome, Billy Elliot-like, rather than the very foundations of future achievement and flourishing. We may now be beginning to scratch our heads and wonder at isolation and social atomism, yet we must consider the impact of having spent a generation and more telling young people that the reason we educate ourselves is to be able to walk away from who we are, or at the very least who we are from. The net result of all of the above was the emergence of a left-wing politics incapable of speaking in the language of the family. Consideration of child welfare was rarely broached: the new morality was about the liberty of consenting adults. The embrace and pursuit of the free-market social sphere dissolved historic obligations to protect the family over and above alternative models, and indeed impressed upon the revolutionaries every reason not to do so. The family, long buffeted by the economic markets, now also buffeted by the social markets, began to dissolve. And its dissolution has destabilised more than anyone else that very constituency that Labour historically fought the hardest to protect. Looking round, it would seem the landscape is changing. The very emergence of Blue Labour testifies to that. Emboldened by opportunities presented by the political dislocation of recent years, more and more dare question the zeitgeist. Following decades of socio-economic flux, there has emerged, in Jonathan Rutherford’s words, ‘an appetite in the country to conserve, safeguard, protect, defend and improve the fundamental elements of social life which are relationships, a sense of belonging, the familiarity of place, social security, the valuing of tradition, history, the past which is the basis of contemporary culture and social meaningfulness.’ The revivification of mutualism and reciprocity in the Labour conversation has meant revolutionary orthodoxies are beginning to creak. People look at the society they have delivered and sense something is wrong. And the questions are fundamental: what has the breakdown of the family achieved? How has it happened? Who has it really set free? How do we make things better? As Andrea Westall has suggested, the implicit neoliberalism of the New Labour years had a tendency to use the language and logic of the markets, even in those places where the market did not belong. A Labour tradition capable of permitting the new conversation, let alone pursuing it, will find itself connecting with the innermost anxieties and concerns of those it wishes to represent. It will ditch its off-the-peg nihilism and once again find fluency in the language of life, of love, of liberty. The left has within its tradition the tools to critique the external pressures placed on the family and the wider community by the advances of global capital systems. With this it offers something unique to the political milieu, allowing it to talk with clarity and wisdom on the pernicious outcomes delivered by the uncritical embrace of globalisation and economic liberalism, most explicit during Thatcher’s reign though embraced further by the New Labour project. Labour also has within its tradition the tools to critique the pressures placed on family and community by the drastic draining of social capital from our communities. This also offers something unique to the political milieu, something genuinely ordered toward the protection of the most vulnerable. Each of these analyses need each other if they are to be truly holistic, truly penetrative in insight. The left seeks to offer the former, but fails in its articulation of the latter, unable to speak the gritty language of lived relationships, incapable of verbalising what most instinctively feel, of taking its insights on vertical systems and institutions and spreading them horizontally through communities and individuals. But it really should. With a renewed critique of liberalism, the left will rediscover the tools with which to fight the unjust pressure being exerted upon those most susceptible to social and economic libertarianism. If, on the contrary, Labour remains speechless on the good, the virtuous, even (dare one say it) the moral, then lost is a narrative lens through which to articulate and determine such fuzzy concepts as ‘social justice’. After all, if one eschews talk of moral and virtuous action, then one can no more deride the selfish pursuit of self-interest that breaks up economies any more than one can deride the selfish pursuit of self-interest that breaks up families – they share the same moral roots. In which case what frameworks, other than mere subjectivistic outrage, does the morally-neutral left have available to call out such conduct? By critiquing liberalism, Labour will rediscover its voice, and rediscover its radicalism. Blue Labour can help our proud tradition re-articulate one of its most important insights: disempowerment comes through fractured of relationships; we are weaker when we cease to live and stand together. John Milbank, ‘Three Questions on Modern Atheism: an interview by Ben Suriano’, The Other Journal, 4th June 2008. Norman Dennis, Families Without Fatherhood (London: IEA, 1992). Phillip Blond, Red Tory: How Left and Right Have Broken Britain and How We Can Fix It (London: Faber and Faber, 2010). This fracture is increasingly visible not between political parties, but within them, seen in the increasing friction on both sides between ‘small c’ conservatives and cosmopolitan liberalism. This sense of dislocation and conflict perhaps explains the interest generated by Jonathan Haidt in his book The Righteous Mind (London: Allen Lane, 2012) in trying to articulate the fundamental sociological and perhaps anthropological aspects of this fracture. An issue explored by Geoff Dench, Kate Gavron and Michael Young, The New East End: Kinship, Race and Conflict (London: Profile Books, 2006). See the influential report Breakthrough Britain: Dynamic Benefits (London: Centre for Social Justice, 2009). Dr Katharine Rake caused controversy when, as the newly installed head of the Labour established Family and Parenting Institute, she used her opening address to talk of the decline of the nuclear family and discouraged use of government to support a now outmoded ‘traditional’ family model. Jon Cruddas, ‘How Labour will strengthen family life and relationships,’ The New Statesman, March 2014. For example, the responses of senior Labour figures to the proposed Marriage Tax Allowance, criticised for being ‘expensive’ and guilty of ‘social engineering’. That the status-quo was both expensive and served to socially engineer was an irony left largely unattended in Labour circles. Tristram Hunt, ‘Divorced from reality’, The Guardian, 9th January 2010. Reactions to the London riots were intriguing in this regard, since they demonstrated a tendency to explain the rioting by appeal to issues of poverty and/or the withdrawal of services and benefit entitlements. Wider concerns regarding family breakdown, loss of parental authority and fatherlessness received far less attention on the political left, though some did choose to assess the importance of these factors, such as David Lammy MP in his book Out of the Ashes: Britain after the riots (London: Guardian Books, 2011). The vote against a clause in the Human Fertilisation and Embryology Bill requiring those undergoing fertility treatment to take into account the need for a father-figure when considering the future welfare of their child is a good example of how fathers had become an optional extra, a motion which attracted the votes of even those politicians who have since rediscovered the importance of fatherhood. Panorama: Britain’s Missing Dads. BBC One, 17 January 2011. Pamphlets such as The Family Way, co-authored by Harriet Harman, Patricia Hewitt and Anna Coote, were full of such prejudices, such that Erin Pizzey, founder of the first battered wives’ refuge in 1971, could criticise the aforementioned as being part of an anti-male and anti-family politico-cultural agenda. The Centre for Policy Studies published a booklet entitled What Women Want (2009) which would suggest the New Left narrative account of liberty does not align with the interests of a majority of women; its account of liberty is too narrow, often restricted to the freedom to go beyond the domestic, yet leaving untouched the freedom to choose the domestic and reject, even for a limited time, the workplace. This option is now available almost exclusively to the wealthy. David Goodhart, ‘A Postliberal Future?’ Demos Quarterly, Issue 1, January 2014. Stephen Twigg, former shadow Secretary of State for Education, articulated this view in his speech at the 2013 Labour Party conference: ‘This [the Primary Childcare Guarantee] will give all parents of primary school children the certainty that they can access childcare from 8am-6pm through their school… A clear message to hard working parents: Labour is on your side.’ Unless, of course, those hardworking parents happen to wish they didn’t have to work so long and so hard and miss their children growing up as a consequence, and who with this have even less of a case to make to an employer seeking extended hours and commitment. For example, the child from Wembley seeking to pursue a career in the professions can conceivably do so whilst remaining geographically close to her family and social surroundings, limiting familial and social dislocation. This is quite often simply not the case in many parts of the country, without the same opportunities, institutions, networks and cultural infrastructure to allow such an option. Since 2009, Blue Labour has been exploring and detailing the growing disconnect between the Labour Party and those whom it has traditionally sought to represent. At its heart has remained a consistent, core insight: an all-out embrace of liberalism, both social and economic, has alienated the Labour Party from its traditional working-class support. This conference aims to further explore those key insights, discerning where common cause might be found beyond the confines of current party orthodoxies, assisting the Labour Party in once again becoming a broad coalition of diverse interests and aims. Panel 1: Who are the postliberals? For its advocates, to be ‘postliberal’ is a very different thing from being ‘anti-liberal’. Whereas the latter might seek to employ authoritarian politics to roll back the social change of previous decades, postliberals would instead pre to embrace where and who we are and think instead of how we shape the future. Quite what this future ought to look like elicits honest and constructive debate, though one common theme emerges: to be postliberal is to seek to re-root politics in traditions of mutualist thought over and above the contract-liberalism of contemporary society and its embrace of negative liberty. For this reason, postliberalism claims to build upon positive accounts of freedom, seeking to rehabilitate notions of tradition, reciprocity, rootedness, mutuality, sacrifice and service into our political discourse, and to recover the language of the particular over the exclusively theoretical and universal. Though not all postliberal thought sits here. For some, the advance of postliberalism signifies a moving beyond the restrictive dogma of contemporary liberal thought and its current draconian instincts: a liberal culture that has embraced authoritarianism as the gatekeeper of its creeds. Whilst postliberals of a different hue might argue that this is precisely what accounts of negative liberty require, others might instead suggest that postliberalism entails a new loosening of the chains, both intellectual and formal, against a creaking liberal order finding itself exposed by the unresolved tensions of its own accounts of liberty. It is here, then, that the postliberal moment can find its expression, in articulating new accounts of the relationship between individual, society and state. In this discussion, panellists will explore the meaning of the term postliberal, explore the question of to whom the term applies, and consider ways in which postliberal thought might offer valuable insights for political thought and policy-making. Following an edict of persecution, St. Laurence was instructed by a Roman prefect to bring forth the treasures of the Church. In response, he rounded up the poor and marginalised, the alienated and dispossessed, and presented them to his Imperial antagonist. For such impudence Laurence would forfeit his life, but he was making something clear: our value rests with how we treat and cherish the least amongst us. Today, Labour finds itself at odds with those communities that might be characterised as the alienated and dispossessed of today. Be it mild embarrassment from the knowing ‘centrist’ or the full-throated denunciation of an activist class ill-at-ease with the values of the communities they purport to represent, Labour has too often failed to appreciate the working-class as a jewel in the crown of our collective movement, but instead as the “awkward squad” to whom we must occasionally pander for reasons of electoral viability. Whilst not wishing to sentimentalise or lionise the class identity of the poorest, we have nonetheless found ourselves in consistent antagonism with it. The fallout for Labour has been punishing. Whilst some blame the party’s embrace of liberalism, others would suggest that the alienation is economic as much as cultural, and almost certainly educational, with sharp value divides coalescing around level of educational attainment. Whilst some, post-referendum, would use this to suggest that those without degrees are the problem, with their (broadly) socially conservative outlook, still others respond that perhaps it is people with degrees that are the problem, and their (broadly) liberal, cosmopolitan outlook. This neatly encapsulates the central tension: a culture clash has emerged, and it pits the party against its traditional supporters. The values of community solidarity that have stood firm in traditional working class communities for centuries, and which have flourished in stable neighbourhoods where people know their neighbours and live close to extended family, struggle to reconcile with the progressive, liberal, diverse, university educated, urbane class that runs the Labour party. And so the question must be asked: how has this come to pass? And must it necessarily be so? Or might there be a ‘hermeneutic of continuity’ from within, re-uniting a tradition that always cherished the contributions of its working-class base, with one that has come to fear its voice? This panel will explore how Labour envisions the status and role of the dispossessed and alienated in society, how it pictures their role and contribution in contemporary society, and explore concrete ways in which Labour might seek to rebuild those fractured relationships. Panel 3: The Greatest Threat to Labour? Labour are losing. Not only elections but, increasingly, their credibility. From a political tradition that has produced some of the finest politicians and indeed politics in recent history, we find ourselves in choppy waters. An electoral and political prominence that seemed to be guaranteed, regardless of personnel change, is showing itself to be far less resilient than many had thought. Commentators have offered a plethora of explanations as to why this might be the case, and there would be a high price on a proven analysis, complete with policy solutions. For some, it is the economic policies of the current leadership that will prove disastrous for Labour, convincing a broadly austerity-accepting electorate that Labour cannot be trusted to govern within the newly restrained expectations of the general public. For others, Labour’s demise is primarily cultural, an all-out embrace of social and economic liberalism which has brought with it a winnowing away of the ties that once bound whole communities into an emotional attachment with the Labour movement. For others, the great danger for Labour lies in lurching toward policy defined by a set of arguments that Labour have passively accepted in a panicked desire to reconnect – particularly in the face of the UKIP surge – but which, in their view, only serve to undermine a left-wing vision of the good life. Whilst for others still, Labour’s manufactured identity crisis is itself the problem, adding unnecessary complexity to a simple problem, that being finding ways to help people overcome the obstacles to the pursuit of the good life: house prices and hospital waiting times, wages and school places, crime levels and food prices. Maybe it is all of these. Or an intermixture of some of them. Or none of them at all, and something else entirely. Whilst Blue Labour has its own account of the emergence and roots of this problem, their analysis is by no means universally accepted, even if it is starting to find traction across a more diverse range of party opinion. Nonetheless, that we have come to accept that a problem exists, and that we must confront it, is itself an encouraging sign of progress and source of hope. This panel will consider where the greatest threats lie for the Labour Party, explore the precise nature of those threats and the manner in which they arose, and begin to suggest possible ways in which those challenges might be addressed. Panel 4: Can Labour Win the (Postliberal) Future? Since her ascent to the role of Prime Minster, Theresa May has won both enemies and admirers at both ends of the political spectrum. In pitching her government programme explicitly at those feeling most alienated by political discourse of recent years, May has sought to reposition the Conservatives as a credible option to that left-behind segment of society long exasperated with the politics and policies of the political left. For a Labour Party confident that only it can advance working-class interest, this is a stinging rebuke: May’s growing popularity amongst working-class voters is proving a bitter pill to swallow. Nonetheless, some believe the reason for this growing approval is clear – politics has changed, the era of liberal dominance is at an end, and Theresa May is reaching out beyond the orthodoxies of yesteryear. This does not elicit universal admiration, of course, and there is every reason to believe that an authentic left-wing politics would narrate this change in a more constructive way. Just as we might claim David Cameron’s ‘Big Society’ proved little more than an intellectual fig-leaf for an austerity politics, so some also see in Theresa May’s embrace of the ‘postliberal’ the same Janus-faced platitudes. It is here that Blue Labour find its voice, to claim that the left can truly own the future: that historic left-wing accounts of reciprocity, mutuality, solidarity – and indeed of the individual, the family, the markets and society – can offer a healthier One Nation politics than anything the Conservatives have to offer. Either way, many now accept that political discourse has entered a new era, even as we struggle to define exactly what it is. So the question presents itself: does Labour have the ability, or the inclination, to change with it? In this discussion, panellists will consider what challenges are presented to Labour by the transformation of the political landscape, explore ways in which Labour might seek to respond to that transformation, and determine how well placed Labour are to flourish in this new political era. So, Corbyn wins. And lots of people are unhappy about it. We know this, because lots of people are tweeting and blogging about How Very Unhappy they are about it. Some have even taken the time to curate their tweets into mini-testimonies, kindly enunciating the precise reasons for their discontent, laced with gloomy predictions for the future. They love Labour, you see – let there be no doubt – and they can’t bear to see what is happening to it. It is surely better, then, to abandon it altogether. And so, they leave. Noisily. With all the fanfare that can be mustered. But the question is: why now? What makes the party so unbearable, at this precise moment, that you cannot stay? Oh I know you feel marginalised and disillusioned – so do I – but that’s normal in politics right? I mean, it’s not as if this hasn’t been going on in the Labour Party for the last couple of decades. Indeed, some of you actively cheered it. The price of ‘modernisation’, apparently. Or maybe we could come at this from another direction: why did you not resign when the party was decimating its working-class support? Why did you not feel so strongly when traditional Labour communities were feeling so systematically ignored? Indeed, so systematically despised? Why did you value your membership over your conscience then? What you’re feeling now, you have put others through. And many of them left, often into the arms of UKIP, abandoning the political inheritance of their forefathers in the process. The result? To further embolden those who had brought about that very alienation, to give them a free pass, thereby turning Labour into a puritanically liberal party, no longer able to reach out to that core base, nor even deem it desirable to do so. And the results – socially, politically – have been disastrous. Do you expect your departure to be any different? Do you expect it will bring forth a bout of reflection, of regret, of penance from those who wave you goodbye? Do you expect that reason will pierce through the groupthink and sense will suddenly dawn amongst the newly victorious? Not a bit of it. It didn’t then, and it won’t now. And only one party benefits from that. In other words, walking away really doesn’t help. I’m not saying I don’t understand it – we give our limited time freely, after all – but the oh-so-very-public departures have more than just a whiff of showboating about them. To the outside, it looks like a group of people who hollowed out our party are flouncing off now that their own dominance is under attack. Unfair? Well, prove otherwise. With actions, not words. We can all beat our chests and mournfully declare the party is going the wrong way, that we’ll never win an election, that the future holds nothing but defeat and despair. Which may well be true. But that likelihood takes on the character of certainty once we all walk away from it. Besides, you helped create this mess; you have a responsibility to stick around and fix it. Or leave. But save me the pious speeches as you slip out of the exit door. So you feel disenfranchised? Alienated? Like your party has been stolen from you? That you have no voice? That you are not welcome? Not valued? Feel that nobody is willing to listen, let alone talk about your concerns? That your political home has been taken over by those hostile to you? That your contribution to the history and indeed DNA of the party has been re-written? Ignored? Mocked? Despised? That without your help, and your support, the party would never have had the success it has? And yet your party now scorn people like you? Call you appalling names? Render your views outside the mainstream? But you did that too. Whilst you were in charge, you did the very same. And here’s the thing: given half the chance, you still would. Indeed, you still do. You’ve learned nothing. If the response to the referendum has shown us anything, it showed us that. You might wail now, but you are simply on the end of the same treatment you dished out to others for so long. You remain as convinced of your own superiority as are those that now displace you; if you hadn’t been, they would never have had chance to replace you. And every time you seek to grab the party back, to regain the levers of power, you do it whilst re-asserting the same. For those you disenfranchised, you are no better option. The worm has turned – you need those whom you made feel so unwelcome for so long; but they no longer need you. So many of them have somewhere else to go now. And the guilt and blame for that lies at your door as much as anyone. But here’s the thing – if your politics is solely about clubbing together with those in the right-hand column against those in the left, then you’ve already lost. And this is what you’ve done. This is how you’ve defined yourself, measured yourself. Any appeals to common ground that cannot bridge this divide is no appeal to common ground at all. You wouldn’t even be willing to unpick the threads, to see what’s going on. Your only explanation is moral degeneracy or intellectual retardation or both. Bigots or blaggards, all of them. You smugly proclaim, eyebrows raised, that the Hard Left would sooner die in a ditch that compromise on their ideals. But so would you. Every bit as much. Indeed, this is exactly what you have done. Exactly what you are doing. And yet, for all that, you are right. The country needs a Labour government. An actual Labour government. Which means we need you. Those who put themselves on the left need to come together. Which means you need those you despise. To find common ground, as the cliché goes. Though to be honest, for all you proclaim it, I’m not convinced you really believe those words. Or could deliver on it. Or would deliver it, even if you could. And so we have a mess. Labour is dead. Long live Labour. Re-posted from the Catholic Herald blog. The original can be read here. Labour is the party of the working class. We weren’t supposed to end up despised by them. We weren’t supposed to end up despising them. But here we are. After decades spent embracing the creeds and infrastructure of liberalism, we are at a juncture which threatens our very existence. Labour’s doctrines have delivered a fractured civic space – we can no longer build coalitions, for where we once saw comrades we now convince ourselves there are only villains. It is the startling descent into misanthropy and insult which hurts most.That moment when Gordon Brown called Gillian Duffy a “bigot” was but a scratching of the surface. The demographic most enthusiastic about voting Leave have been dismissed as racist or xenophobic for years, but it is only in the last few days, following the referendum, that I have seen the very legitimacy of their suffrage questioned – the prosperous, well-educated liberal left, summoning Victorian-era paternalism to question the wisdom of giving votes to the ill-educated. Of course, this chasm between party and people is of surprise only to those cloistered away amongst the like-minded. Much has been made of the demographic divide between the two competing mindsets prior to the referendum. But turning this into one-dimensional face-off between the haves and the have-nots presumes an irresolvable conflict. That’s too pessimistic: there is a way out of our current malaise. But we first need to understand what has gone wrong. It can be summed up in a word: liberalism. Blue Labour provided an account of the impact of liberalism upon our relationships, from the economic to the social to the romantic to the filial. Liberty defined over and against the duties and obligations we owe one another, we contended, served only to loose the ties that bind our futures together. In a barren, empty landscape, free of obstructions, cold winds blow unfettered – and it has been the poorest who have felt the chill most keenly. In a world in which our futures compete and do not cohere, we have found it difficult to forge a politics for all, since we have convinced ourselves that not all have a place in our politics. Labour embraced the new liberalism more keenly than any, first socially, and then in the realm of economics, in so doing surrendering its conservative defence of the family and society against the excesses of market and power. Offering to patch up the victims with state largesse has proven insufficient. People want livelihood, stability and dignity, whilst all we offer is low-grade subsistence delivered with a slight sneer at a class of people quietly deemed unfit for this newly globalised world. It is quite an irony: in proclaiming “diversity”, we have become homogenous, no longer able to even understand the language of our comrades, let alone speak it. Until it boils over. And then everybody has a theory about what has gone wrong and why. Most of these analyses consist in reinforcing much of that which has brought us to the precipice. Those who presided over the years in which Labour became so very distant from its core communities are now the ones seeking to lay all the blame at the door of its current leader. By trying to make this about Jeremy Corbyn, Labour are leading themselves away from a truth they must confront: this is about Labour. And so the gap lengthens, and the people have turned from exasperation to active hostility. And we, as a party, have made ourselves unable to respond. Whatever happens next will be historic in the future of Labour. If, after whatever happens next, we still have a party called Labour. Either way, one thing is certain. There is a new politics. One wonders if a new party might be needed to meet it. 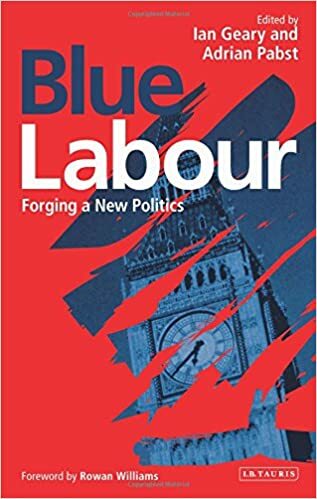 I wrote a while back that Labour really needed Blue Labour in order to ‘get back in the game’. The phrase came from an interview with a Labour MP who, talking on Labour’s prospects in the North, had said that when he goes into pubs and clubs of his constituency all talk is about UKIP and Labour are not even in the game. Which one might find odd, considering clichés about Labour’s strongholds. But then we had confirmation of much the same yesterday, with an ostensibly working-class (and certainly Northern) male, talking with Ed Miliband and recounting a conversation he recently had in his local, noting that talk was of turning away from Labour and backing UKIP. One thing we must get straight: UKIP is not the problem for Labour. No, as things stand, Labour is the problem for Labour. Which, on the plus side, means that the answer to the problem is Labour too. Not as the assertion that we’re right and everyone else is wrong, but in the recognition that our tradition is right and that to exclude huge swathes of those who authentically articulate it has been terribly wrong. Nonetheless, the (selection) arteries are clogged up, and seeking to move toward diversity – the genuine sort – will need concerted action from the centre. But to do so, to take such drastic action, requires first the articulation of this long excluded voice, to provide an infrastructure of thought and expression that can proclaim the Labour vision in a concrete and compelling way. Without that, there is only nostalgic sighs and apathetic shrugs. Which is perhaps what the Blue Labour collection of essays, due out next Friday, could be – the flesh on the bones of a movement that currently exists as the echo of a nearly-forgotten tradition, that yet contains within it a rich seam of thought, with the potential to address in new ways those anxieties that are the mark of contemporary times. Labour really needs to get back in the game – particularly in those places it has long thought impregnable. Even if Blue Labour is not the entire solution, it can certainly help us better understand the problem. And that is in all our best interests.